"It smells like hair, but how can smell if there is no air? It sounds like an old lady screaming, but you can't hear screams in space. It feels solid like a tree branch and bumpy like most rocks on the moon. It tastes like glasses and tastes like sand." The partial poem is one of the latest from a young patron of the Field Museum, inspired by the museum's first poet-in-residence, Eric Elshtain. 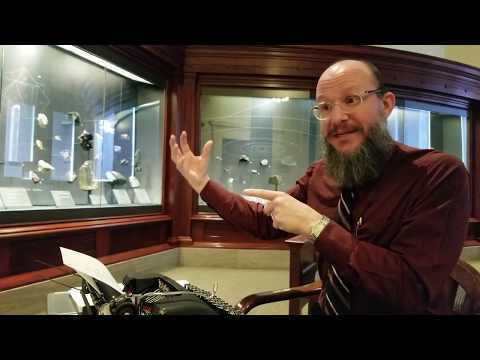 Elshtain, an Oak Park resident, spends every Wednesday morning and afternoon at the museum – he sets up shop every week with a small desk and old-school manual typewriter – and encourages museum goers to ponder some of the deeper questions of the Chicago institution. During a recent visit to the museum, Elshtain had posted himself next to a stairwell near a collection of various space rocks, hence the poem. Elshtain was challenging passersby to consider the question: "What does a space rock taste like?" He said he wants to bridge the gap between poetry and science and use the literary form to "formulate questions and begin to come up with answers and begin to describe the feelings they have about objects and specimens that they see in the museum." "I also spend my time writing my own poems about objects that I surround myself with," he told Wednesday Journal. "Every Wednesday I put myself in different parts of the museum." Angelica Lasala, public relations coordinator for the museum, said the new poet-in-residence program is part of the museum's mission to "inspire journeys of discovery so that we can find solutions to a brighter future rich in nature and culture." "Whether that means bringing a full, touchable skeletal cast of the largest dinosaur ever discovered to introducing a poet-in-residence here to really liven the visitor experience and help folks find connections between science and art, we want to be at the forefront of people's experience with the natural world," Lasala said. Poetry is a full-time business for Elshtain, who holds a master's degree in fine arts from Columbia University and a Ph.D. in poetry from the University of Chicago. In addition to the poet-in-residence program, he works as a writer-in-residence at hospitals around the Chicago area and hosts poetry workshops. At the Field Museum, Elshtain said he tries to "use the techniques and tools of poetry to get at some descriptions of these objects in much the same way that the labels tell us certain factual aspects about these objects." "Poetry can be, hopefully, that space in which people can describe questions or ideas or feelings for which they don't have any other outlet or they may not know they have an outlet," Elshtain said. Elshtain said he recently encountered a father and his son who were contemplating one of the Field Museum's most popular exhibits – Sue, the Tyrannosaurus rex that's roughly 67 million years old. Elshtain said the father and son were thinking about Sue's heart when they came across his poetry station. "The father and the boy had a conversation about Sue's heart and that led to the father and boy to work together on a haiku ruminating on the notion of Sue's heart – something that they couldn't see but that the exhibit drew out of them," Elshtain said. "It wasn't until they came to my little desk and saw me typing away that they felt they had an outlet." The station was good at drawing a crowd during a recent visit to the museum, and Elshtain is no wallflower. "Hey, that's a typewriter," he said to families with young children – many of whom have never seen a manual typewriter – passing by his station. One family visiting from Michigan decided to come to the museum specifically because they read about the poetry program. Erica Sloterbeek, 17, of Allendale, Michigan, who likes to write poetry, said her dad surprised her with Elshtain's poetry station. She says she mainly writes couplets and poems with simple rhyme schemes. "I love poems," Sloterbeek said, adding that writing poems provides an emotional outlet. "My dad's an English major, so it runs in the genes." Another man, Chris Fleming, from Tucson, Arizona, said he also decided to check out the museum after reading about Elshtain. Fleming said he wanted to hear Elshtain's thoughts about contemporary poetry and what he considers a trend away from writing about universal truths and focusing more on the individual. "I learned a lot by talking to him," Fleming said. The program just recently launched, so Elshtain will be available to share and discuss poetry for the foreseeable future. He can be found at the Field Museum with his 1943 Smith-Corona Sterling typewriter every Wednesday between 10 a.m. and 2 p.m.
"What poetry has to do with science is they both begin with observation," Elshtain said. I wonder if he is related to Jean Bethke Elshtain (1941-2013) who was a nationally-known philosopher, ethicist, and public intellectual as well as Professor of Social and Political Ethics at The University of Chicago Divinity School.